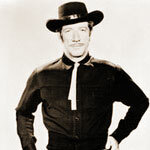 Have Gun, Will Travel was a superb western series broadcast from 1957 to 1960 on CBS. John Dehner portrayed Paladin, a gunfighter and champion-for-hire. Ben Wright played Hey Boy. Virginia Gregg played the role of Miss Wong, Hey Boy's girlfriend The show originally started as a TV series on CBS. After its immediate success, CBS adapted the TV version on the air during the fading years of the radio. Both versions of the show ran concurrently, but the TV version remained strong and lasted to 1963. Highly ranked with Gunsmoke and The Frontier Gentleman, Have Gun, Will Travel was one of the finest western radio programs of all time. The plots of Have Gun, Will Travel follows the adventures of Paladin in the wild west at the turn of the century. As a high-priced troubleshooter for hire, Paladin prefers to settle problems without violence, yet he always excels when circumstances dictate. As a man of conscience, Paladin seeks out the wrongdoers and restores justice in his own right. Each episode opens with Paladin's vow, "If the girl who's being held prisoner has been harmed in any way, I'll flip a coin to see which one of you I gun down first." Paladin narrates his adventures in his deep, lonely voice. As a loner, Paladin never seems to have any real attachments, except his relationship with Hey Boy. Get access to all 40,000+ Vintage Radio Shows! Help keep Vintage Radio Shows alive! Six Month Membership - $47.70 - Great Value! Whole Year Membership - $87.45 - One Month Free! Try these other Old Time Radio Shows out for size!